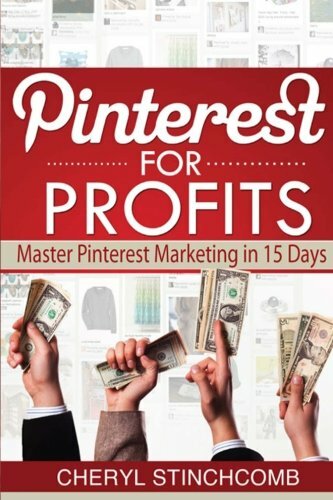 In Pinterest for Profits: How to Master Pinterest Marketing in 15 days, Cheryl Stinchcomb delivers the best comprehensive Pinterest training for business that includes a step-by-step process with screenshots and detailed activities for each day to keep you on task. Promoting your business on Pinterest has never been easier. Pinterest for Profits highlights: * 16 Ways to Profit Using Pinterest (even if you don’t sell products) * The 6 Keys to the Perfect Pin * Top 15 Most Creative Pinning Ideas for your Business * Learn How to Create an Infographic in an Hour using Free Templates * 47 FREE strategies to market any business on Pinterest * 7 Best Practices to Running a Killer Pinterest Contest ….and so much more!